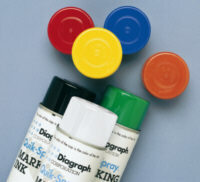 These opaque aerosol inks are great for stencilling or colour coding. Quik spray inks dry in just 30-60 seconds.The orange aerosol has been discontinued. Currently out of stock, please contact us for earliest availability.